WAILUKU — Naia Nakamoto was in no mood to help Baldwin High School celebrate homecoming on Saturday night. The Maui High junior running back piled up 199 yards and four touchdowns in the first half to lead the Sabers to an insurmountable 34-point lead at the break on the way to a 44-6 win. The result clinched the Maui Interscholastic League Division I first-round crown for the Sabers (2-1). Nakamoto finished with 246 yards on 21 carries. 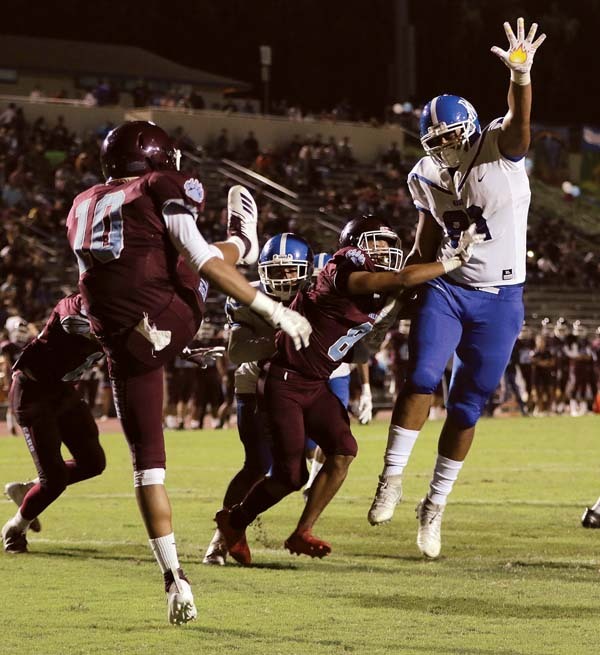 Maui High turned on the mercy-rule running clock when Mitchell Hirose caught a 23-yard scoring pass from Brex Delray with 2 minutes, 16 seconds left in the third quarter. The Sabers put a somber mood over the large Baldwin homecoming crowd early, blasting out to a 21-0 lead early in the second quarter. Nakamoto carried the ball five times for 59 yards on the opening drive, a 65-yard march that took 10 plays and 4 1/2 minutes off the clock. Nakamoto’s final carry was a 25-yard touchdown up the middle of the field. “Very special athlete, very proud of our offensive line for their effort, receivers for blocking down the field, and also Naia also kind of found himself tonight with some confidence and with his abilities,” Kammerer said. Nakamoto started the Sabers’ next possession with an 18-yard run and then they went to the air, Delray hit Hirose for a 24-yard strike to the Bears’ 7-yard line. Delray dove in from the 1 two plays later. Hirose returned a punt 34 yards to the Baldwin 9 and it took just one play for Nakamoto to put the third touchdown on the scoreboard early in the second quarter. The Sabers went 60 yards in seven plays on their next possession after their defense stopped Baldwin on downs. Nakamoto’s 20-yard run made it 27-0 with 4:34 left in the half. The Bears thrice drove well into Maui High territory in the first half, but the Sabers stopped them the first two times on downs and the clock ran out on the final possession. The next-to-last possession of the half for Baldwin reached the 20 before Laa Asuega-Stark’s fourth-down pass was tipped away in the end zone. He was sacked by Atu Falekaono on the last play of the half. Nakamoto raced 80 yards on the first play from scrimmage and to push the Sabers’ lead to 34-0 with 1:07 left before halftime. Baldwin (1-3) must now look to the second round to get to the state tournament. 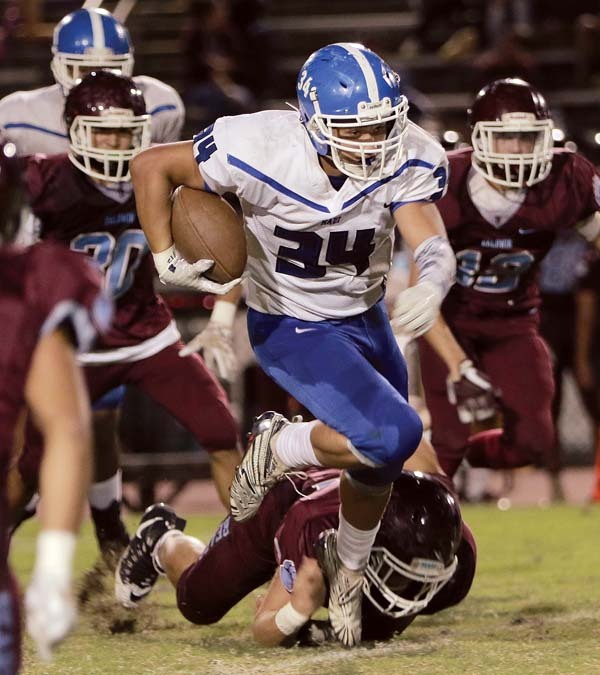 Maui High piled up 373 yards of offense, while the Sabers defense limited Baldwin to 191. The Bears did find a passing attack that accounted for 184 yards between Asuega-Stark and five different receivers. 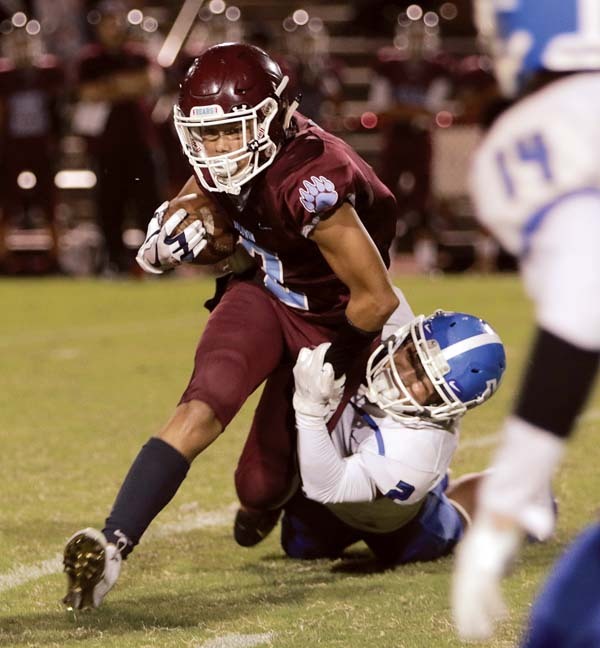 Their touchdown came in the fourth quarter, a 14-yard strike from Asuega-Stark to Kapena Kamai on fourth-and-11 that cut the deficit to 41-6. MH–Naia Nakamoto 25 run (Brex Delray kick), 7:26. MH–Delray 1 run (Delray kick), 2:17. MH–Nakamoto 9 run (Delray kick), 11:34. MH–Nakamoto 20 run (kick failed), 4:34. MH–Nakamoto 80 run (Delray kick), 1:07. MH–Mitchell Hirose 23 pass from Delray (Delray kick), 2:16. B–Kapena Kamai 14 pass from Laa Asuega-Stark (kick failed), 11:15. MH–Jeremy Gonzalez 31 FG, 3:28. 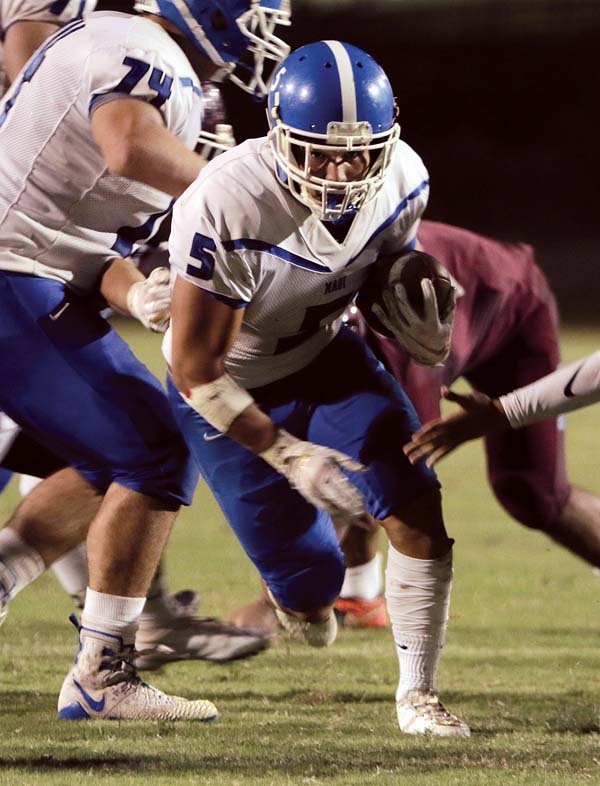 The Maui News / CHRIS SUGIDONO photo King Kekaulike’s Trey Hunter runs the ball in the second quarter.